Visconsi Companies’ newest retail development, The City Market in Mentor, Ohio, has begun store openings. Wendy’s opened in late December. 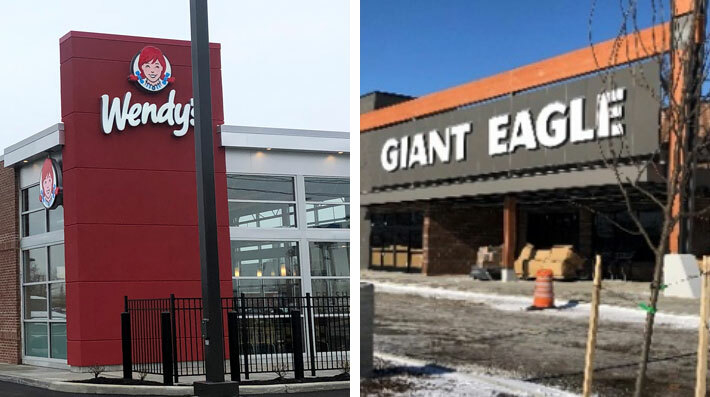 The center’s anchor, Giant Eagle supermarket, is scheduled for a late spring opening. Recently signed Taco Bell plans to open late this fall. Giant Eagle is one of the 40 largest privately-held and family-operated companies in the USA with nearly 400 retail locations in Pennsylvania, Ohio, West Virginia and Maryland. Wendy’s at The City Market is its 6670th store worldwide. Taco Bell and its franchisees operate more than 7,000 restaurants globally. The City Market is located at the SWQ of Route 2 and Route 615 in Mentor. The center, which required an assemblage of six parcels, is supported by two new traffic lights that are fully operational. The city of Mentor houses one of northeast Ohio’s super-regional trade areas, which draws its customers from all of Lake County, Ohio’s 230,000 people and parts of eastern Cuyahoga County. The city ranks sixth in the State of Ohio in volume of retail sales only behind Columbus, Cincinnati, Toledo, Cleveland and Akron. Over 1,700 companies with more than 32,000 employees including major corporations, manufacturers, retailers and small businesses are located in Mentor. For leasing inquiries for The City Market’s remaining outparcels, please contact Mike Olsen, Vice President of Leasing.